More and more couples are choosing to forgo the tradition of having a wedding cake when it comes to their big day. 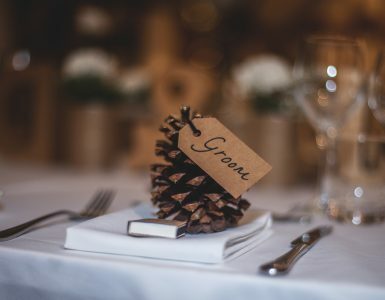 Personalisation in all aspects of the wedding are becoming commonplace right down to the sweet treat served up at the reception. Whilst we will never tire of the classical, tiered cake, this is an opportunity for couples to do something unique to them and have a little fun at the same time. Whether it’s a buffet-style dessert table showcasing a selection of your favourite confection or simply your favourite childhood dessert, homemade by family members and friends or carefully baked and prepared by a caterer, couples could also potentially save money by passing on the traditional cake. For more money saving tips, read our 8 Top Money Saving Wedding Tips blog post. We share with you some of our top favourite wedding cake alternatives. Can’t decide between carrot cake, red velvet or Black Forest gateau? Why not have them all! Serve up miniature, bite-sized versions of your favourite bakes (have a big one made and cut it up into small pieces) and top with pretty, edible flowers. Having a summer wedding? Why not serve up ice cream as your after dinner treat. Create an ice cream station with a selection of different flavours and let guests create their own sundaes by providing a variety of toppings e.g. sprinkles, caramel sauce, crushed nuts, chocolate chips, hot fudge sauce, marshmallows and rice krispies. Alternatively, why not hire an old school ice cream van for added nostalgia. Cupcakes will forever be a favourite for many occasions not just weddings. Tower up your buttercream-frosted (match with your colour scheme perhaps), miniature cupcakes in an assortment of flavours and top with a one-tiered cake for those who still want that special cake-cutting/photo op moment. Never been able to resist grabbing a fried ring of goodness every time you go out for your mid- morning coffee? Why not share your favourite sweet treat with your guests. You can create a tower (or several) of doughnuts with a variety of fillings to cater for everyone, from original glazed to honeycomb custard, and classic raspberry jam to indulgent nutella. Finish with a bride and groom wedding topper. Why not present your favourite desserts in shot glasses? Not only will they scream elegance, they’re much more easier (and less messy) for guests to eat from. Pretty much any dessert can be served up in a shot glass but remember, the more contrasting layers, the more eye-catching. Think strawberry jam and white buttercream-filled, classic Victoria sponge, topped with a fresh cut strawberry and a dusting of icing sugar, or Tiramisu; coffee-soaked sponge layered between Amaretto cream, topped with a light dusting of cocoa powder. For those who much prefer their savoury snacks over their sweet treats, why not opt for a cheese tower instead? Go for a variety of cheeses i.e. hard, soft, blue, cow/goat/sheep milk etc, stack them up in the style of a traditional cake, and decorate with fresh cut figs, a mix of green and red grapes, slices of chopped apple, dried fruit and a side of nuts and crackers. Voila! WeddingInsurance.com.au is Australia's leading wedding insurance company. Offering the lowest wedding insurance quotes and fantastic customer service.